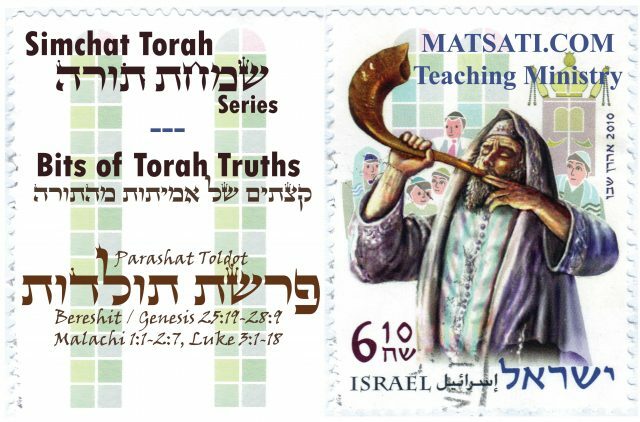 Bits of Torah Truths, Parashat Toldot, What was it about Esau that the Lord hated? In this week’s Torah Portion from Parashat Toldot (Shemot / Genesis 25:19-28:9), we are told that there are twins in Rebecca’s womb who are struggling together (25:21-23). The Scriptures state that Esau became a skilled hunter while Jacob dwelled in tents (25:27-28). Dwelling in tents, Jacob learned about the covenant and the promises of God. Esau on the other hand was out in the field hunting and mingling with the surrounding peoples. His understanding of the covenant and the promises of God was affected by his actions of not remaining near the home and learning from his parents about God. This interpretation is consistent with Sforno’s commentary on Bereshit / Genesis 25:27 on the tent being a place of study and drawing near to the Lord, and the commentary on Chol HaMo’ed Sukkot, titled “Our Tent, Our Home, and the Purpose of Creation.” The Torah describes these things in a very brief manner, and according to the narrative, we learn that Esau despised his birthright. His disbelief is demonstrated in his selling the rights of the first born (הַבְּכֹרָה) for a bowl of soup (25:29-34), and of his taking a wife from the daughters of Canaan (26:34, לד וַיְהִי עֵשָֹו בֶּן-אַרְבָּעִים שָׁנָה וַיִּקַּח אִשָּׁה אֶת-יְהוּדִית בַּת-בְּאֵרִי הַחִתִּי וְאֶת-בָּשְֹמַת בַּת-אֵילֹן הַחִתִּי:), which was strictly forbidden according to the covenant God had made with Abraham. Following the Torah’s description of Jacob and Esau, the narrative continues saying there was a famine in the land and the Lord instructed Isaac not to go to Egypt. This led to Isaac’s interaction with Abimelech (26:26-31). Abimelech took Rebecca and the Lord cursed his family in a similar manner as what had happened during Abraham’s life. The Torah portion concludes with Isaac wanting to bless Esau and Jacob tricks his father to obtain Esau’s blessing (27:1-41). The portion concludes with Jacob fleeing to Haran (27:42-28:9) out of fear for his life and his brother. This week’s reading contains a number of significant events in the life of both Jacob and Esau which are relevant throughout the history of Israel and all of Scripture. The Scriptures tell us that there were two nations, two peoples in the womb of Rebecca. The struggle between these two peoples is related to the one who walks by faith and the other who despises God’s ways. This week, let’s discuss the significance of what it means to take God’s word seriously. In the reading this week, Esau is out hunting and he is very hungry. He returns home and sees Jacob fixing a pot of soup and the Torah tells us what Esau said to Jacob saying, ל וַיֹּאמֶר עֵשָֹו אֶל-יַעֲקֹב הַלְעִיטֵנִי נָא מִן-הָאָדֹם הָאָדֹם הַזֶּה כִּי עָיֵף אָנֹכִי עַל-כֵּן קָרָא-שְׁמוֹ אֱדוֹם: 25:30 and Esau said to Jacob, ‘Please let me have a swallow of that red stuff there, for I am famished.’ Therefore his name was called Edom. (NASB) It is interesting how Esau describes the food that Jacob is making, he says, הַלְעִיטֵנִי נָא מִן-הָאָדֹם הָאָדֹם הַזֶּה “I want to swallow / consume this red stuff.” Esau uses a Hiphil Imperative verb הַלְעִיטֵנִי meaning “to swallow or greedily devour,” this red stuff (הָאָדֹם הַזֶּה). It is important to note what he calls the food (הָאָדֹם) that Jacob is cooking. The word הָאָדֹם from the root אֲדָמָה means “earth, ground, soil.” What is the significance of Esau’s choice of words? The rabbis have the following to say concerning Esau’s choice of words. Sforno simply points out that Esau called the name of the food HaEdom, but does not really expand upon the meaning. Edom, on the other hand, is impure, his food habits are worse than those of other nations, as had already been demonstrated by their patriarch Esau when he wanted the lentils Jacob had cooked (Genesis 25:30). He said to Jacob: הלעטני נא מן האדם האדם, “Please pour some of this red, red (food) down my throat.” The exile the Jewish people suffer under the dominion of Edom is by far the worst. The Torah uses the pig as a symbol of the abominable manner in which this animal pretends to be pure, displaying its cleft hooves as proof, while refusing to chew the cud, symbol of paying homage to G’d. The mystical dimension of all this is described in Deut. 33:2 וזרח משעיר למו … כל קדושיו בידך והם תכו ברגלך. When food descends in a beneficial manner and is sacred in nature it is described as: “G’d You open Your hand” (Psalms 145:16). Shelah, Shmini, Torah Ohr 19, draws a parallel to Edom and impure foods. The commentary states that the interpretation of Esau and future Edom is found in his carelessness in the manner in which he describes the food. It was very likely obvious what Jacob was cooking, based upon smell. It would have been all right to ask his brother for a bowl and to ask the contents of the soup, but instead he demanded saying, ַלְעִיטֵנִי נָא מִן-הָאָדֹם הָאָדֹם הַזֶּה “I want to swallow / consume this red stuff.” The imagery we get here is Esau was born into a family that served God and had faith in the Lord God (he was a child of Isaac), he walked the walk, his father Isaac loved him greatly, however, he was a deceiver and he had a disregard for this birthright and the covenant of God. The commentary describes him with the symbolism of the pig, that the animal pretends to be pure indicated by the outward display in his cleft hoof, but refused to do what was right internally (chewing the cud), which is symbolic of paying homage or respect to God. He did not do what was right in his heart. We on the other hand are called to do what is right on both the inside and the out. One must observe table manners, not gulp down one’s food as did Esau when he sold Jacob his birthright (Genesis 25:30). We have a tradition that a wicked person will always feel that his belly lacks something, is hungry (Proverbs 13:25). When the Torah writes לפני ה’ אלוקיך, this is always to emphasize that we must maintain the presence of positive rather than negative, חצוניות. Shelah, Re’eh, Derech Chaim Tochachot Musar 5, makes an interesting observation regarding Esau’s statement ַלְעִיטֵנִי נָא מִן-הָאָדֹם הָאָדֹם הַזֶּה “I want to swallow / consume this red stuff.” The parallel this commentary draws is to one gulping down one’s food under the idea that one’s stomach was more important than his birthright. The interpretation here may be that Esau was a man who was given to his appetite, he searched out and consumed something based upon his lusts. Another interpretation is with regard to the unrighteous, the wicked do not care about the ways of God, the covenant of God, or the righteousness of God. The connection of the covenant is to the people, the community, helping one another, serving one another, and having love for one another. These things are described in the Torah and the Apostolic Writings as our service to the Lord God in heaven. The wicked on the other hand do no such thing, in fact, they feel their bellies are always lacking something, always hungry. The wicked are given to their appetites and the lust of the flesh. The importance of remembering or recognizing these things is found in the phrase from the Torah לפני ה’ אלוקיך “in the presence of the Lord your God,” saying as the children of God, we are always in His presence if His Spirit is dwelling in us, and therefore the emphasis is that “we must maintain the presence of positive rather than negative” which may be interpreted as we are not to live according to our carnal appetites. We are called to raise above unrighteousness, and the Lord God helps us to do so in Yeshua the Messiah and by the power of His Spirit. Sforno notes that Esau was absorbed in his occupation, as a hunter, and living according to his own desires. The task of man on earth is to seek and serve the Lord. In Esau’s case, he was so deceived, he was unable to even recognize the lentils but “referred to them only by their color, he called him by that name himself, i.e. אדום, in the imperative, meaning paint yourself red by swallowing the red dish!” Esau was careless in his life, so much so that even in the obvious things, he changed the meanings and then lived his life accordingly. :מן האדם האדם הזה, a reference to the lentils, which when peeled, look reddish. The reason why he repeated the word האדם unnecessarily was that it reflects his intense desire for them. This is why he called his name Edom, to reflect the fact that he was always attracted, nay, fascinated by anything red. Radak focuses upon the reason why Esau repeated the word הָאָדֹם. He says that the reason was because of his intense desire for all things red. Red is a dominant and bold color that commands attention. Red gives the impression of seriousness and dignity, and it represents heat, fire and rage, and it is known to escalate the body’s metabolism. Red can also signify passion and love. Red promotes excitement and action. It is a bold color that signifies danger, which is why it’s used on stop signs. Using too much red should be done with caution because of its domineering qualities. Red is the most powerful of colors, and this may be the reason why Radak focuses upon the repetition of the word הָאָדֹם. Esau in his actions, his disregard for the rights of the first born (הַבְּכֹרָה), the covenant, and the promises of God (he disregarded God’s Word), his heart was on fire, he was careless, senseless, and domineering in qualities. This word הָאָדֹם fits him perfectly and there is good reason his descendents were known as Edom. There is an interesting parallel in Tehillim / Psalms 80 in which Asaph is describing the nation and people who come against Israel. Asaph asks why the Lord has broken down the wall (גְדֵרֶיהָ) so that all, everyone (כָּל-עֹבְרֵי) may וְאָרוּהָ “pluck, gather,” who pass the path/way (דָרֶךְ). Notice how he is saying all or every person who comes this way will pluck from the vine. The nations are now taking of the good things from Israel, as opposed to only the people of Israel partaking in the good things. The Aramaic Targum states that those who pass on the way are pruning (cutting away at) her, suggesting that the pruning process is different from simply the picking of the fruit. Note again how Asaph equates these people with the boar (pig), and the idea that the boar roots around in the dirt and uproots everything. The boar eats the roots, the vine dies. The roots are foundational with regard to the vine which produces fruit. The vine is unable to produce fruit if the root is destroyed, the entire plant dies. Notice the connection here to Esau in his actions, his disregard for the rights of the first born (הַבְּכֹרָה), for the covenant, and the promises of God (disregard for His Word), his heart was on fire, he was careless, senseless, and domineering in qualities. This is similar to what these nations who enter into the Land of Israel as the boar, rooting around without care or respect for the holy things of God. Does God care about how we worship Him? What does it mean to not serve the Lord God in the way the nations serve their gods? At what point may we relax this command? The Lord God speaks expressly concerning these things and the significance of being careful in our service before the Lord in Devarim / Deuteronomy 12. Let’s read through Devarim / Deuteronomy 12 and see how this is connected to the way in which Esau lived his life. Notice all of the things that Devarim / Deuteronomy 12 describes. The chapter opens with being careful to obey the Lord, the God of our fathers. We are told to destroy all of the places the nations worshiped (12:2-3) and we are told not to learn these things or serve the Lord our God in a similar manner (12:30 beware that you are not ensnared to follow them, after they are destroyed before you, and that you do not inquire after their gods, saying, ‘How do these nations serve their gods, that I also may do likewise?’ NASB). These Scriptures speak of the free will offerings, and to be careful to worship the Lord in the place He chooses, not in the place of our own choosing or in the places the nations served their gods. We are also told to be careful not to drink the blood (12:16); note the connection to Acts 15:20 (“Instead we should write to them, telling them to abstain from food polluted by idols, from sexual immorality, from the meat of strangled animals and from blood.” NIV). Note how eating as much meat as desired is repeated along with the prohibition to drinking the blood (12:20-25). Devarim / Deuteronomy 12 concludes with the command to be careful to obey the Lord and not to add or take away from His word. The connection to Parashat Toldot is found in the prohibitions against taking part in what the nations were doing. Esau took part and joined himself with the surrounding nations. The command to be careful to obey the Lord is connected to being faithful in His word, just as Abraham clung to the service of God, to speak of His promises, and to add to the number of people who believed in the One True God. Esau did no such thing, he simply served his appetites, he walked in the way that he thought was right in his own eyes with a disregard for both the rights of the first born (הַבְּכֹרָה), the covenant, and the promises of God. He was careless in the teachings of his fathers, and he did not take God’s word seriously. This is significant because faith, our service to God, and how we worship Him, are all connected to the covenant, the community of people, to helping one another, to serving one another, and having love for one another. When it comes to our service to God, why do you think today so little emphasis is placed upon how we worship God? The Lord tells us not to add to or take away from His word right here in Devarim / Deuteronomy 12. He tells us not to add to His worship anything that is a tradition of the heathen, the custom of the nations. The Lord God Himself calls such things abominations, and practices that He hates. Notice how He warns us not to be “ensnared to follow” the practices of the nations. The Torah is alerting us to the fact that heathen or ungodly practices, the customs of the nations, their ways of worship, traditions, celebrations, have characteristics that appeal to our human nature. These things function to make us feel good. This is the way Esau behaved, he did what felt good, he lived according to his appetites. By living according to his appetites, he become caught up in them and then consumed by them that led to his disregard for God’s word because it felt better to practice the traditions of the nations rather than to serve the Lord God of Abraham.